Last week we rearranged our living room and in doing so, wanted to create a little more storage space for board games – without having a wall filled with boxes from top to bottom. So we decided to create a place in which we could store games and as a place to chill on or just use as extra seating when we’re having friends over – and this is what we’ve done! We don’t think it’s necessary, but you could make the ‘seating’ more spacious by attaching a wooden panel to the top and side and combine that with some support beams behind the cabinet. That way you can easily make the furniture look fancier and you can make the seating less narrow. And if it looks cluttered, you can always add some doors. 🙂 You can also make some interesting corners with old fruit crates, like this! We’ve had a busy week again and only played Azul, Root and Lords of Xidit. Azul is always fun to play and with Root, we finally tried the factions that come with the expansion. It was clear how to play the Riverfolk, but we couldn’t get a grip on the Cultists. They somehow stayed far behind on the scoring track, so we might have to look into some strategy guides to figure out how to play them better. Lords of Xidit was a real surprise and had been on our to-play list for quite a while! It was a way “lighter” than we thought and we simply loved the scoring at the end of the game. 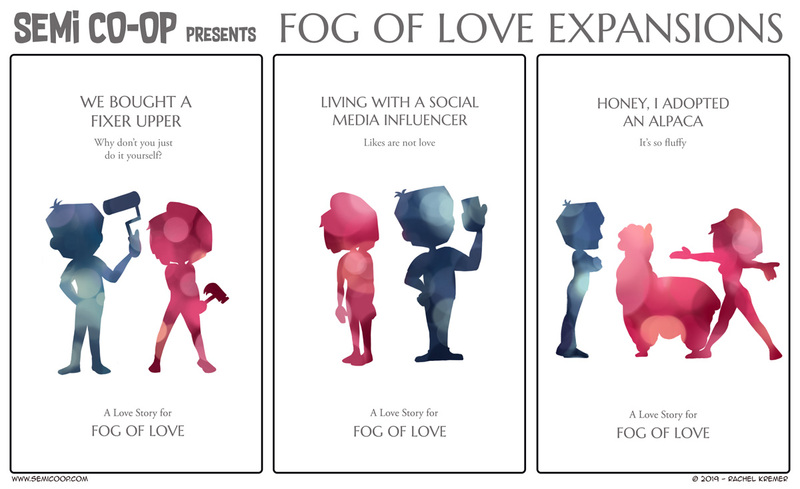 What would be your suggestion for a Fog of Love expansion?